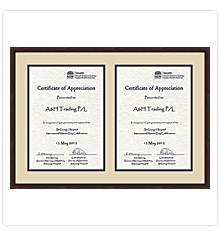 Professionally made certificate frames that are designed to conserve and display your achievements in the highest quality. 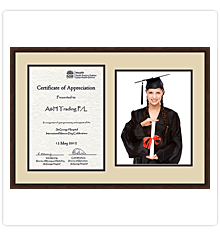 These frames are set for standard sized documents, certificates, professional licenses or any other award, along with the option of adding a photograph beside it. 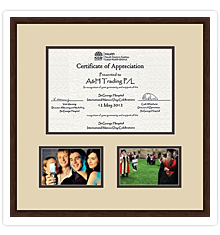 At Frameshop we allow you to be the designer, so with our tools you can create your own personal certificate frame to suit your needs. As a recommendation, we suggest selecting the 5mm Non-Adhesive Foamcore backing after you've selected your frame as it is acid-free and will conserve your documents quality whilst still allowing you to remove them if neccessary. 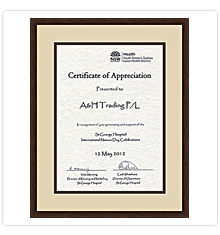 If you would like to have a digital image printed and mounted with your certificate, please head to our Upload page, and choose the printing only option before adding the image to your shopping cart. 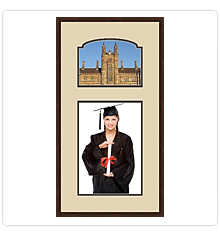 To get started simply choose a template below and you'll be able to customize the matting and framing options.